Fourth of July, 1900, Henry H. Wegert, first row, third person from left. 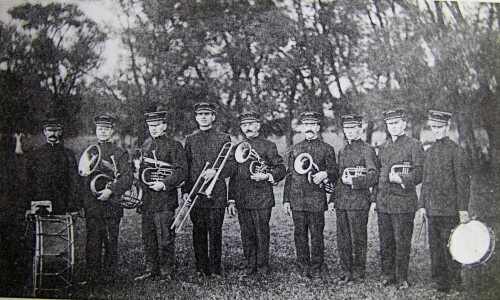 Trombone player. 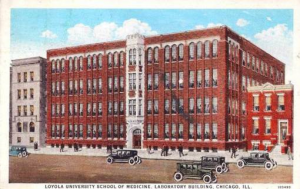 Two of Beecher’s young men have become full-fledged doctors, having received their “sheep skins” from the Bennett Medical College at Chicago at their graduation on last Monday. Ed Hack, son of Mr. and Mrs. Henry Hack, and Henry H. Wegert, brother of R.H. Wegert, our tonsorial artist, were the two who were honored. Both young men are well and favorably known, and their many friends will join us in wishing them success in their chosen professional vocation. 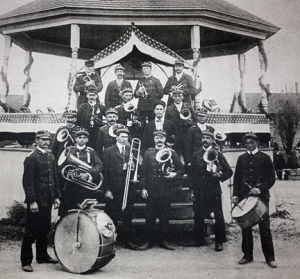 Those from Beecher who attended the graduation exercises were: Mr. and Mrs. Frank Hack and son, Arthur; Mr. and Mrs. Henry Hack; Herman Hack and family; Mr. and Mrs. H.F. Thielman and children; Dr. and Mrs. D.D. Van Voorhis; Mrs. Henry Bielfeldt and son, Elmer; Mr. and Mrs. R.H. Wegert; Albert Hack and Miss Marie Deneke. Dr. Wegert has accepted an interne at the West Side Emergency Hospital at Chicago, and Dr. Hack and his college friend Dr. Methrow, who also graduated, Monday, have accepted a like call at the Rockford Hospital. All three young doctors are thrifty, ambitious and full of vim and no doubt will become popular and successful in their profession as physicians and surgeons. 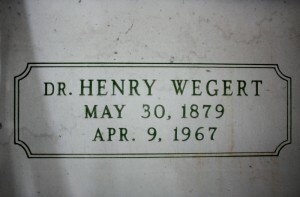 Funeral services were held at the Hack Chapel, Beecher, for Dr. Henry Wegert, 3145 Belden Ave, Chicago, on Wednesday, April 12. Dr. Wegert passed away Sunday, April 9, at the Lutheran Deaconess Hospital, Chicago, following a lingering illness. Born May 5, 1879 in Defiance, Ohio, he was 87 years of age. Survivors include a sister-in-law, nieces and nephews. He was preceded in death by his wife Lillian Bahlman Wegert. Rev. John Melchert of Park Forest officiated at the services, and burial was in the Beecher Mausoleum. 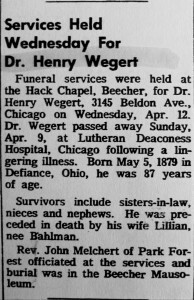 Funeral services were held Wednesday at Hack chapel, Beecher, for Dr. Henry Wegert, 87, of 3145 West Belden avenue, Chicago. 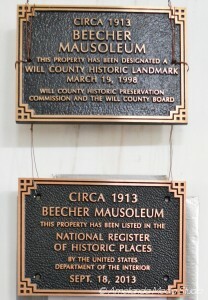 Interment was at the Beecher Mausoleum. 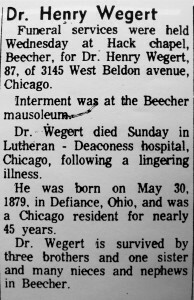 Dr. Wegert died Sunday in Lutheran – Deaconess Hospital, Chicago, following a lingering illness. 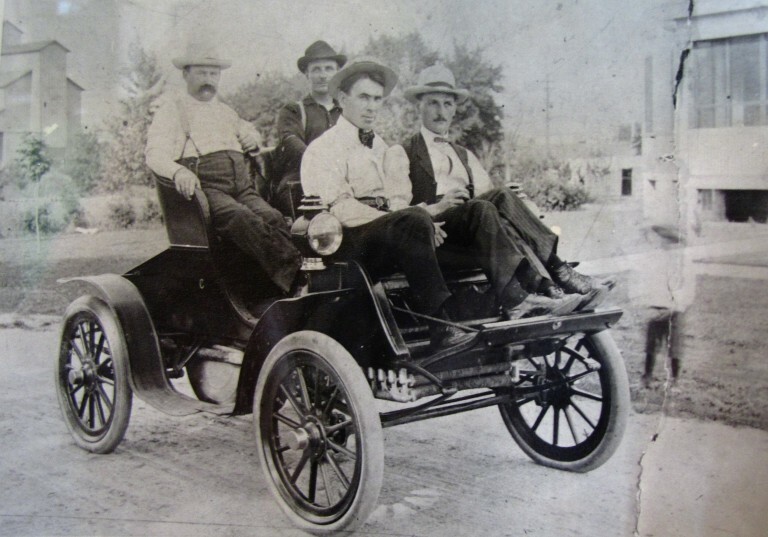 He was born on May 30, 1879, in Defiance, Ohio, and was a Chicago resident for nearly 45 years.